Main Fabric. For all versions, you’ll want a medium to lightweight knit fabric. Some types of fabric that are suitable are jersey, lighter French terry, double knits, and baby rib knits. Lining Fabric. For version 1, you’ll also need a lightweight jersey knit lining fabric. 1/4” clear elastic. The clear elastic will help us gather and stabilize the waist of the skirt. For the main fabric of your Moneta, you’ll want to look for a medium or lightweight knit fabric. This covers a rather broad spectrum of fabrics, depending on the type of dress you want to make. Generally, you want something in a sort of Goldilocks zone – not too heavy and not too light. On the lightweight end of the spectrum, you will want to consider how sheer the fabric is. The skirt is unlined on all versions, and the bodice is unlined in versions 2/3, so you’ll want to make sure the fabric provides enough coverage. On the heavier end of the spectrum, avoid anything too solid and stable, like very thick sweatshirt fleece, as the gathered skirt will end up too bulky and won’t hang quite right. For the bodice lining in Version 1, you will want a lightweight jersey that won’t add too much bulk. If you’re using a light colored shell fabric, keep in mind that high contrast colors and prints might show through. Seam gauge. Not absolutely necessary, but very helpful when hemming. Ballpoint Needles. They may also be labeled as jersey needles. Ballpoint needles are designed to push through threads rather than pierce them, so they help prevent runs and snags in your fabric. Twin Needle. A twin needle will allow you to create a professional looking stretchy hem. Look for one labeled ‘stretch’. All purpose thread. You’ll need all-purpose polyester or cotton thread on regular spools. 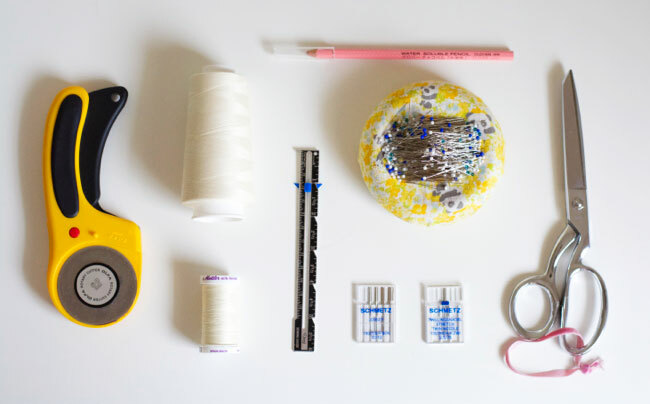 If you are using a serger, you’ll also need cone thread. You can make the Moneta using either a serger or your standard home sewing machine. We’ll discuss techniques on both in a future post. 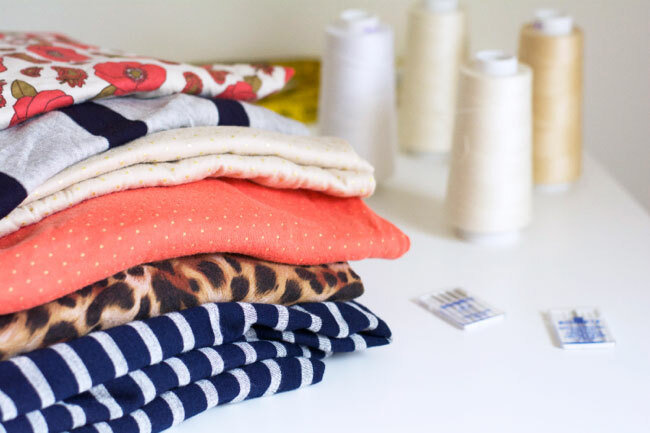 If you’re using a serger, you’ll still need your standard machine on hand for hemming and a few other small tasks. Before we begin, you should prewash your fabric in whatever manner you plan on caring for the finished garment. This is not something you want to skip, as knits have a tendency to shrink more than wovens. This is my first sewalong–I’m excited! I’ve been checking out the Moneta pattern for a while but haven’t been sure since I’m not very experienced with knits, so I’m glad this is being offered! Thanks for mentioning the prewashing. I did so out of habit, but I was a bit surprised at it not being mentioned in the Colette knit book. It did make my fabric harder to lay out for cutting, but better that than making a dress that doesn’t fit! Yes, we definitely don’t want our clothes to shrink after all our hard work! 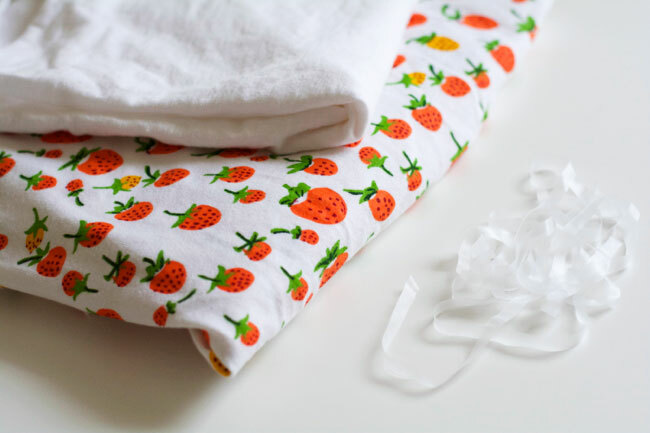 Are you using the Heather Ross Strawberry fabric for your Moneta? I would love to know how it works! I love the print, but was scared to purchase it because it says 100% cotton. I used the Valorie Wells wish knit (also 100% cotton) to make myself a Mabel an it turned out gorgeous, but has no “recovery” so it gets stretch out when I wear it and slips down. Does the recovery matter as much with this pattern as it does with the skirt? Thank you! I wish! I don’t have quite enough of the strawberries. I did use it to make a long sleeved tee and it worked very well. I’m familiar with the Valori Wells wish knit, and I would say the Heather Ross knits have just slightly less stretch, which might help you out. I think the strawberries would be fine to use, as long as you’re ok with the dress being a little looser by the end of the day. And this wouldn’t matter as much as with the Mabel, because the dress will be supported by the bodice and wouldn’t have to be nearly as fitted to stay up. I’m assuming we can use the 3/8″ clear elastic which is all I’ve found in the stores. I’d love to order it as it’s opaque and fits close to the body, but I worry about how the handling while sewing. Unfortunately when you order things online it’s hard to really know until you feel the fabric, but I think you’ll be fine! It’s a double knit so it’s going to be a little on the thicker side, which will make it more stable. Yay! 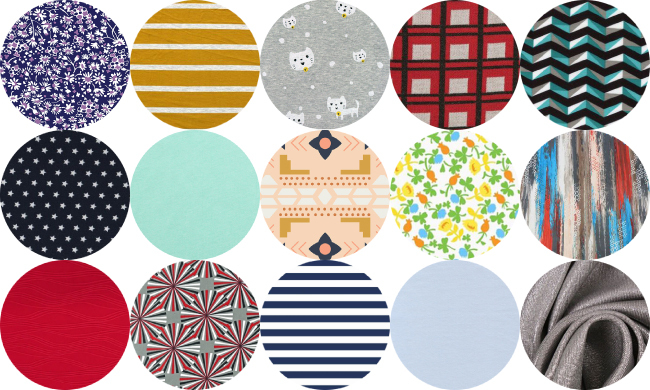 I ordered fabric from Girl Charlee for 4 monetas (2 for me, one for my mom, one for my sister) and I’m excited to see them! I might add a collar to one, which means I need to hunt down knit interfacing, which I don’t think is on your list here. Unless your fabric is very lightweight, it isn’t necessary to interface the collar. If you’d like you can do a little test with the fabric by sewing two layers together, turning right side out and seeing how they feel. If you were to use interfacing, then yes you’d definitely want to make sure you’re using knit interfacing. If you’re making version 1, the bodice is lined, so you can just add a lining to the skirt. If you’re doing version 2 or 3, then yes you can definitely underline the bodice. Just make sure the fabric you choose for the underlining has a similar stretch to the shell fabric. For either version, I would recommend lining the skirt as opposed to underlining. So make a whole other skirt out of the lining and attach it at the waist when you attach the outer skirt, but leave it hanging free, as opposed to being attached to the outer skirt at the hem and side seams. Just ordered my fabric! I have a brand new serger and this will be my first time working with knits. Excited to have a sewalong to get the hang of both! Hi, my Brother machine came with a twin needle. It’s probably a general use one. Is there much difference between that stretch one? It probably has a universal point, which should work. The best thing to do is test it out on the fabric you’ll be using to make sure it doesn’t skip stitches. A stretch twin needle will have a ball point, which makes it more specialized for stretchy fabrics. This is my first attempt at sewing a dress from a pattern- I’ve really just been tailoring clothes until now. This is such a beginner question, but I’m clueless on how many yards to order. I’m 5 ft tall, bust 32, waist 24, hips 32. How many would you recommend? Thank you! Oh, I just realized you had linked to the pattern in the first post. I found the info on how many yards of fabric to get, but it looks like I am smaller than the measurements… which brings me to another question. Since I’ve never used a pattern before, forgive me if this is a silly question, but how exactly do I sew from a pattern that’s slightly too big? I don’t want to have to tailor a dress that I made myself! Since this is your first time following a pattern, I’d highly recommend making the smallest size and following the pattern as is. You are very close to the measurements, and it will be easy to take in the side seams a little if you think it’s too big. As you continue sewing, you’ll see that different pattern companies have different size charts, because they all draft from different blocks. So just keep that in mind while you’re shopping! Does the pattern have metric quantities for buying the fabric? I’m in Canada and want to buy it locally.. they only do it in metric. I only saw the imperial measures. A yard is a little bit less than a meter, so if you buy the yardage quantity in meters you’ll have enough plus a small amount extra. If you want to be very exact, if you type ‘x yards to meters’ into google it will convert it for you. Here is a link to Colette’s metric size chart if you need it! It would probably be ok, but it might stretch out over the course of the day and might have a baggier look to it. Hi there, just getting my bits and pieces together and I have noticed that twin needles come in different widths, which I think is how far apart the two needles are? e.g. 2.5mm, 4mm. I was just wondering if you could give any advice one which size to get? Thanks very much, can’t wait to get started. I’d go with the 4.0 one. The 2.5mm can be a little too close together and make a ridge on the fabric. I had a question about the lining fabric for Version 1. Can I simply use the same fabric for both the shell and the lining or will it be too heavy? The fabric I’m using is a lightweight Rayon knit. Thanks! Sure, you can use the same fabric, as long as it isn’t too thick [which it doesn’t sound like it is!]. Just make sure you don’t get them mixed up as we go. Oh I also had a question about the clear elastic. Is it a thick elastic? Or is it the same sort of thin elastic used in RTW clothes that need hanger straps? Hi Devon! This is my first sewalong and I’m very excited :) I have some ponte knit in my stash – is this suitable fabric? Yes, it should be ok as long as it’s not super thick! I will actually be using some ponte for one of the demo dresses. I’d like to make my Moneta with a cotton rib knit. I know the extra stretch in the fabric won’t work with my normal size pattern. Is there some guidance about how much negative ease I should have? Also can I use a woven collar for more stability? One thing I like to do is measure the front bodice paper pattern piece at body measurement landmarks [bust and waist], subtract the seam allowances, then measure that distance across the uncut fabric. Then you can stretch that amount of fabric around the front of your body at the measurement points and see how it will fit. I would hesitate to cut a smaller size just because you’re using rib knit, since you can sew the side seams with a bigger seam allowance if you feel that the bodice is a little too big, but if you cut it too small then it’s just too small. For adding stability with the collar, I might suggest using a stable knit as opposed to a woven. The rib knit will be so stretchy around the neckline, so as you’re trying to attach it to something that is not really stretching at all you might get some ripples. But you can always test it out on some small pieces and see how it goes. You also might want to stabilize the neckline with fusible stabilizer, strips of knit interfacing or clear elastic. Bust 32, Waist 26….I notice the completed waist measurement is 22. I read that we shouldn’t worry since the waist stretches, just need for you to confirm that since comfort important. So I would purchase fabric according to XS measurements? Also, I am pretty old, don’t wear my dresses too short, need it to be at least a bit below the knee…how much fabric extra in 45″ or 60″ would I need? I am hoping to find a medium jersey knit today at the fabric store. What size twin needle should I purchase? Your instructions are super, I am such a beginner….this is going to be fun. Ease is personal, and also depends a little on the fabric you pick. I’d recommend stretching 11″ of your fabric around the front of your waist and see how it feels. If you think you might be uncomfortable with that amount of negative ease you can cut out to a size small at the waist very easily. The fabric requirements for both sizes are very similar. If it were me I would just get it based on the size small. The dress hits at about knee length on average heights. The finished back length measurement is 33″ for the XS. You’ll need to decide how much longer you want the skirt, then get double that amount of extra fabric because you need to cut two skirt pieces. So if you want to make the skirt 4″ longer, you’ll need 8″ extra fabric yardage. For the twin needle, look for 4.0/80 or 4.0/75, universal or stretch. Thanks Devon. How is the back length measured….is it from the knob at the bottom of the neck to the desired length? Excited to get sewing, may have to jump the gun. I do have one complaint about the layout of the digital pattern PDF. (Well, two complaints actually). I’m just finishing assembling the digital pattern now, and holy cow does it need a lot of paper! I wish I’d looked at the layout more closely before printing, because choosing to print only one version (1), only saves 6 pieces of paper!?! There is sooooo much white space between pieces, and there are several pages which are either blank or nearly blank. Grrr. The other issue I have with the PDF is that the margins sizes are not consistent. I use a paper cutter and my usual assembly process of setting the edge and slicing the right side of the whole stack did not work – the margin kept jumping around! Anyway, hope the actual sewing goes better! Hi, I have bought my fabric and am about to pre wash it, but how should I dry it so it doesn’t stretch? Thanks! It shouldn’t stretch when you dry it. If anything it might shrink. Generally you want to dry the fabric in the same way you’ll dry the finished garment. Hi Devon! I’ve been busy with a wedding and out of state visitors for a couple of weeks and JUST saw the sew along was beginning for the Moneta! I bought the paper pattern and the electronic version of the knits book a couple of months ago and my sister just brought a beautiful claret double knit for me that she’d gotten while shopping the LA fabric district (Michael Levine’s). I’m SO excited that I’m only a day (or so) behind. I’ll go back and read what I’ve missed (washing fabric and picking up any notions I’ve not gotten yet). This is my first garment sew along, so I’m terribly nervous and excited! Hello and welcome! You are going to do marvelously! If you have any questions along the way, just leave a comment and I’ll do my best to answer. Hi Devon! thank you for the fabulous sewalong. I’m already in the process of making my first Moneta and have just gotten my fabric in for two more! (I know, I just could not resist). One of my fabrics, though, is too much on the side of a very soft, fluid jersey, as opposed to the more cotton-like feel of the knit I am working on right now. Do you think that kind of fabric would still work for this pattern? It’s super soft, maybe if I underline it? I loved your yellow Moneta, what fabric did you use? It was absolutely gorgeous :) Thanks again!!! Hooray! A fluid fabric will still work! You can line the bodice if it’s very thin, either by making version 1 or by adding lining to version 2/3. My yellow Moneta was a ponte, so it was on the thicker side of things.